Ritual is a repeated event. It is a sequence and something that orients us to the reality of the repetition of life. The fact that life goes on. Drumming is an act of repetition. It gives us a sense of the organization of the universe. It gives us a glimpse of eternity. Then we come back to our tried and true ritual and we get through another day. Putting on a suit and tie is a ritual. Putting on robes is a ritual. The same effect of connecting us to our lives in a daily way. 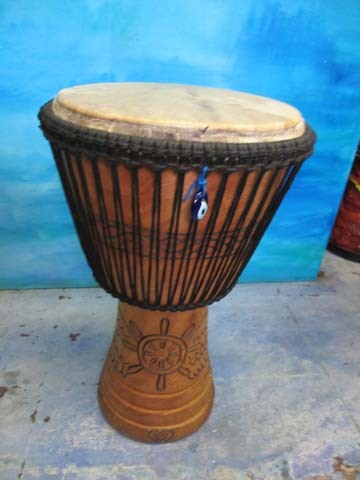 This is a HelmTone healing djembe carved in Ghana. We have worked with the master carvers for over 25 years. They are cured for a year at least, through “Hamitan” season where the golden dust of the Sahara dries the wood slowly. This gives the drums exceptional durability and sound.